Jarrett Walker has repeatedly called transit agencies and city zoning commissions to engage in anchoring: this means designing the city so that transit routes connect two dense centers, with less intense activity between them. For example, he gives Vancouver’s core east-west buses, which connect UBC with dense transit-oriented development on the Expo Line, with some extra activity at the Canada Line and less intense development in between; Vancouver has adopted his ideas, as seen on PDF-page 15 of a network design primer by Translink. In 2013, I criticized this in two posts, making an empirical argument comparing Vancouver’s east-west buses with its north-south buses, which are not so anchored. Jarrett considers the idea that anchoring is more efficient to be a geometric fact, and compared my empirical argument to trying to empirically compute the decimal expansion pi to be something other than 3.1415629… I promised that I would explain my criticism in more formal mathematical terms. Somewhat belatedly, I would like to explain. First, as a general note, mathematics proves theorems about mathematics, and not about the world. My papers, and those of the other people in the field, have proven results about mathematical structures. For example, we can prove that an equation has solutions, or does not have any solutions. As soon as we try to talk about the real world, we stop doing pure math, and begin doing modeling. In some cases, the models use advanced math, and not just experiments: for example, superstring theory involves research-level math, with theorems of similar complexity to those of pure math. In other cases, the models use simpler math, and the chief difficulty is in empirical calibration: for example, transit ridership models involve relatively simple formulas (for example, the transfer penalty is a pair of numbers, as I explain here), but figuring out the numbers takes a lot of work. With that in mind, let us model anchoring. Let us also be completely explicit about all the assumptions in our model. The city we will build will be much simpler than a real city, but it will still contain residences, jobs, and commuters. We will not deal with transfers; neither does the mental model Jarrett and TransLink use in arguing for anchoring (see PDF-p. 15 in the primer above again to see the thinking). For us, the city consists of a single line, going from west to east. The west is labeled 0, the east is labeled 1, and everything in between is labeled by numbers between 0 and 1. The city’s total population density is 1: this means that when we graph population density on the y-axis in terms of location on the x-axis, the total area under the curve is 1. Don’t worry too much about scaling – the units are all relative anyway. 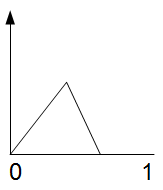 Let us now graph three possible distributions of population density: uniform (A), center-dominant (B), and anchored (C). Let us make one further assumption, for now: the distributions of residences and jobs are the same, and independent. 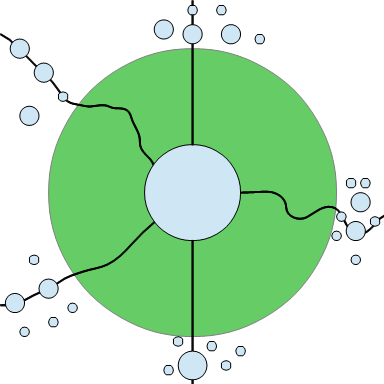 In city (A), this means that jobs are uniformly distributed from 0 to 1, like residences, and a person who lives at any point x is equally likely to work at any point from 0 to 1, and is no more likely to work near x than anyone else. 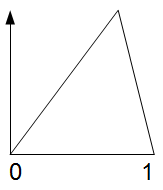 In city (B), this means that people are most likely to work at point 0.5, both if they live there and if they live near 0 or 1; in city (C), this means that people are most likely to work at 0 or 1, and that people who live at 0 are equally likely to work near 0 and near 1. Finally, let us assume that there is no modal splitting and no induced demand: every employed person in the city rides the bus, exactly once a day in each direction, once going to work and once going back home, regardless of where they live and work. Nor do people shift their choice of when to work based on the network: everyone goes to work in the morning peak and comes back in the afternoon peak. With these assumptions in mind, let us compute how crowded the buses will be. Because all three cities are symmetric, I am only going to show morning peak buses, and only in the eastbound direction. I will derive an exact formula in city (A), and simply state what the formulas are in the other two cities. Now, city B’s buses are almost completely empty when x < 0.25 or x > 0.75, and city C’s buses fill up faster than city A’s, so in that sense, the anchored city has more uniform bus crowding. But the point is that at equal total population and equal total transit usage, all three cities produce the exact same peak crowding: at the midpoint of the population distribution, which in our three cases is always x = 0.5, exactly a quarter of the employed population lives to the west and works to the east, and will pass through this point on public transit. Anchoring just makes the peak last longer, since people work farther from where they live and travel longer to get there. In a limiting case, in which the population density at 0 and 1 is infinite, with half the population living at 0 and half at 1, we will still get the exact same peak crowding, but it will last the entire way from 0 to 1, rather than just in the middle. Note that there is no way to play with the population distribution to produce any different peak. As soon as we assume that jobs and residences are distributed identically, and the mode share is 100%, we will get a quarter of the population taking transit through the midpoint of the distribution. 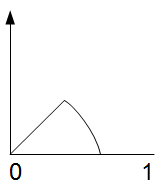 If anything, the most efficient of the three distributions is B. This is because there’s so little ridership at the ends that it’s possible to run transit at lower frequency at the ends, overlaying a route that runs the entire way from 0 to 1 to a short-turn route from 0.25 to 0.75. Of course, cutting frequency makes service worse, but at the peak, the base frequency is sufficient. Imagine a 10-minute bus going all the way, with short-turning overlays beefing frequency to 5 minutes in the middle half. Since the same resources can more easily be distributed to providing more service in the center, city B can provide more service through the peak crowding point at the same cost, so it will actually be less crowded. This is the exact opposite of what TransLink claims, which is that city B would be overcrowded in the middle whereas city C would have full but not overcrowded buses the entire way (again, PDF-p. 15 of the primer). In my empirical critique of anchoring, I noted that the unanchored routes actually perform better than the anchored ones in Vancouver, in the sense that they cost less per rider but also are less crowded at the peak, thanks to higher turnover. This is not an observation of the model. I will note that the differences in cost per rider are not large. The concept of turnover is not really within the model’s scope – the empirical claim is that the land use on the unanchored routes lends itself to short trips throughout the day, whereas on the anchored ones it lends itself to peak-only work trips, which produce more crowding for the same total number of riders. In my model, I’m explicitly ignoring the effect of land use on trips: there are no induced trips, just work trips at set times, with 100% mode share. Let us now drop the assumption that jobs and residences are identically distributed. Realistically, cities have residential and commercial areas, and the model should be able to account for this. As one might expect, separation of residential and commercial uses makes the system more crowded, because travel is no longer symmetric. In fact, whereas under the assumption the peak crowding is always exactly a quarter of the population, if we drop the assumption the peak crowding is at a minimum a quarter, but can grow up to the entire population. Consider the following cities, (D), (E), and (F). I am going to choose units so that the total residential density is 1/2 and so is the total job density, so combined they equal 1. City (D) has a CBD on one side and residences on the other, city (E) has a CBD in the center and residences on both sides, and city (F) is partially mixed-use, with a CBD in the center and residences both in the center and outside of it. Residences are in white, jobs are in dark gray, and the overlap between residences and jobs in city (F) is in light gray. In city (F), the quarter of the population that lives in the CBD simply does not count for transit crowding. The reason is that, with the CBD occupying the central quarter of the city, at any point from x = 0.375 east, there are more people who live to the west of the CBD getting off than people living within the CBD getting on. This observation remains true down to when (for a symmetric city) a third of the population lives inside the CBD. In city (B), it’s possible to use the fact that transit runs empty near the edges to run less service near the edges than in the center. Unfortunately, it is not possible to use the same trick in cities (E) and (F), not with conventional urban transit. The eastbound morning service is empty east of the CBD, but the westbound morning service fills up; east of the CBD, the westbound service is empty and the eastbound service fills up. If service has to be symmetric, for example if buses and trains run back and forth and make many trips during a single peak period, then it is not possible to short-turn eastbound service at the eastern edge of the CBD. In contrast, if it is possible to park service in the center, then it is possible to short-turn service and economize: examples include highway capacity for cars, since bridges can have peak-direction lanes, but also some peaky commuter buses and trains, which make a single trip into the CBD per vehicle in the morning, park there, and then make a single trip back in the afternoon. Transit cities relies on services that go back and forth rather than parking in the CBD, so such economies do not work well for them. A corollary of the last observation is that mixed uses are better for transit than for cars. Cars can park in the CBD, so for them, it’s fine if the travel demand graph looks like that of city (E). Roads and bridges are designed to be narrower in the outskirts of the region and wider near the CBD, and peak-direction lanes can ensure efficient utilization of capacity. In contrast, buses and rapid transit trains have to circulate; to achieve comparable peak crowding, city (E) requires twice as much service as perfect mixed-use cities. The upshot of this model is that the land use that best supports efficient use of public transit is mixed use. Since all rich cities have CBDs, they should work on encouraging more residential land uses in the center and more commercial uses outside the center, and not worry about the underlying distribution of combined residential and job density. Since CBDs are usually almost exclusively commercial, any additional people living in the center will not add to transit crowding, even as they ride transit to work and pay fares. In contrast, anchoring does not have any effect on peak crowding, and on the margins makes it worse in the sense that the maximum crowding level lasts longer. This implies that the current planning strategy in Vancouver should be changed from encouraging anchoring to fill trains and buses for longer to encouraging more residential growth Downtown and in other commercial centers and more commercial growth at suitable nodes outside the center. Several commenters, both here and on Streetsblog, have raised a number of points about my proposal to eliminate above-ground Penn Station and reduce the station to a hole in the ground. A few of those points are things I’d already thought about when I wrote that post and didn’t want to clutter; others are new ideas that I’ve had to wrestle with. However, I take exception to the notion that when the train runs every hour, passengers wait an hour. When I lived in Providence, a few trips to Boston, New Haven, and New York taught me the exact amount of time it’d take me to walk from my apartment to the train station: 21 minutes. I learned to time myself to get to the station 2 minutes before the train would leave, and as I recall, I missed the train twice out of maybe 30 trips, and one of those was when I had a lot of luggage and was in a taxi and couldn’t precisely gauge the extra travel time. Walking is that reliable. People who get to Penn Station by subway have to budget some extra time to account for missed subway trains, but from much of the city, including the parts of the CBD not within walking distance from Penn, the required spare time is less than 10 minutes. Moreover, Penn is at its most crowded at rush hour, which is precisely when subway frequency is the highest, and people can reliably time themselves to within less than 5 minutes. Outlying train stations in Switzerland are deserted except a few minutes before a train shows up, because the connecting transit is all timed to meet the train. This is of course inapplicable at very large stations with many lines, but the modes of transportation that most Penn Station users take to the station are reliable and frequent, if you can even talk of frequency for walking. The result is that the amenities do not need to be extravagant on account of waiting passengers, and do not need to be more than those of a busy subway station in a busy area. Do nothing. A large proportion of the usable area of the platforms would be located under the walkways above, or under the escalators and staircases. Having measured the depth more precisely, through Plate 14 here, I found it is 13 meters from street level to top of rail, or 12 from street level to platform level, translating to 21 meters of escalator length, plus 2.2-2.5 meters on each side for approach (see page 23 here). About 16 of those 21 (18.5 out of 25.7, counting approaches) meters offer enough space for passengers to stand below the escalators, leading to large areas that could be used for shelter, as noted in the waiting section above. Build a simple shelter. Stockholm-area train stations have cheap corrugated metal roofs over most of the length of their platforms. These provide protection from rain. Of course those roofs require some structural support at the platform, but because they’re not supposed to hold anything except rainwater, those supports are narrow poles, easy to move around if the station is reconfigured. Build a street-level glass pane. This may be structurally intricate, but if not, it would provide complete shelter from the elements on the track level, greatly improve passenger circulation, and create a new public plaza. But in summer, the station would be a greenhouse, requiring additional air conditioning. Note that doing nothing or building a simple shelter would not protect any of the track level from heat or cold. This is fine: evidently, open-air stations are the norm both in cities with hotter summers than New York (Milan is one example, and Tokyo is another) and in cities with colder winters (for example, Stockholm). Passengers are usually dressed for the weather anyway, especially if they’re planning on walking to work from Penn or from the subway station they’re connecting to. Multiple commenters have said that public art and architecture matter, and building spartan train stations is unaesthetic, representing public squalor. I agree! I don’t think a hole-in-the-wall Penn Station has to be drab or brutalist. It can showcase art, on the model of the mosaics on the subway, or the sculptures on the T-Bana. It can use color to create a more welcoming environment than the monotonous gray of many postwar creations, such as the Washington Metro. The natural sunlight would help a lot. But more than that, the walkways themselves could be architectural signatures. The best way to build them without supporting them on the track level is some variant on the arch bridge – either the classical arch bridge (which would require three or four spans), or a through-arch. This gives a lot of room to turn the bridges into signature spans. The design work would raise their cost, but short pedestrian bridges tend not to display the same cost structure as massive vehicular ones; the Bridge of Strings, a Calatrava-designed light rail bridge on a line that cost far more to build than light rail should cost, was $70 million for 360 meters. The walkways would not carry light rail, and would be about 140 or 150 meters in span. Commenters both here (Caelestor) and on Streetsblog (Bolwerk, Matthias, C2check) have brought up transit-oriented development as a reason to allow a tall building on top of the station. With respect, I think on top of a train station is exactly the wrong place to build a tower. Let’s Go LA has an explanation for why the engineering for air rights is so complicated, although he stresses that Penn Station and Grand Central, which were built with the expectation of future high-rise air rights, are exceptions. I’ll add that Penn Station track simplification would also remove many crossovers and switches, making it easier to build air rights. That said, the track spacing is not friendly to the column spacing he proposes. In New York, the tallest and most expensive recent private-sector office tower on solid ground, the Bank of America Tower, cost around $6,000 per square meter of floor space, in today’s money. Some of the luxury residential towers are more expensive; so are the new World Trade Center buildings, e.g. One World Trade Center was $12,000 per m^2. But the office towers cluster in a specific band of cost, around $2,500 to $5,000 per square meter, with taller towers generally more expensive. The Hudson Yards air rights towers cost in the $10,000-14,000 per square meter range, as much as One World Trade Center. Contrary to Bloomberg’s promises of windfall property tax revenues as his justification for the 7 extension, the city has had to offer tax abatement to encourage developers to build at those prices. Amtrak’s plan for Penn Station South assumes the block immediately south of Penn Station would cost $769 million to $1.3 billion to acquire; when I roughly computed its floor area by counting floors per building, I got 100,000 m^2, which means the price of real estate in that area, $7,700-13,000/m^2, is no higher and may be lower than the construction cost of air rights towers. In contrast, some sites on firm ground immediately surrounding Penn Station are ripe for redevelopment. The block south of Penn Station, as noted above, has about 100,000 m^2, for a block-wide floor area ratio of 6.7. The Empire State Building’s floor area ratio is 33, so replacing the block with closely spaced supertall towers would require developers to burn just 20% of their profit on acquiring preexisting buildings. To the north of Penn Station, the two sites at 7th and 8th Avenues, flanking One Penn Plaza, are flat; so is nearly all of the western part of the block northeast of Penn, between 33rd and 34th Streets and 6th and 7th Avenues. Eighth Avenue is not developed intensely at all in that latitude – it only becomes important near Times Square. Supertall buildings surrounding Penn Station could even be incorporated into the station complex: railroads using the station might decide to lease offices in some of them, and the exteriors of some of those buildings could incorporate large clocks, some signage, and even train departure boards. TheEconomist, who has had some truly out-of-the-box ideas, raises a very good point: how to phase the deconstruction of Penn Station in ways that allow service to continue. I don’t have a complete answer to that. Arch bridges, in particular, require extensive falsework, which may complicate matters. However, a general phase plan could consist of knocking down the above-ground buildings, then removing the upper concourse (leaving only the lower), and then removing arms of the lower concourse one by one as the walkways above them are built. In comments here, people have suggested several alternatives to my proposal to reconfigure Penn Station to have 12 tracks and 6 island platforms between them. There should be 6 approach tracks, as I outlined here: southern approach tracks, combining new Hudson tunnels with a link to Grand Central (which I call Line 2); central tracks, combining the preexisting Hudson tunnels with the southern East River Tunnels (Line 1); and northern tracks, combining the realigned Empire Connection and West Side Yard with the northern East River Tunnels (Line 3). Staircases should be 3 meters wide. Escalators with 1-meter steps have 1.6-meter pits; their capacity is theoretically 9,000 passengers per hour, but practically only 6,000-7,000. Clearing 30 entire trains per hour, filled to seating capacity with 4 standees per square meter of standing space, requires moving about 75,000 passengers per hour. (Per meter of train length, this is comparable to the 4/5 trains and the RER A at their peaks.) With 6 access points, this requires 2 up escalators per access point. The minimum is then 3 escalators, running 2-and-1 at the peak; 4 is better. In comments, Ari Ofesvit proposes the Spanish solution, which I’ve discussed in previous posts. I’m now convinced it is not the right solution, simply because it compels platforms to be too narrow (about 8.6 meters), which has room for exactly half of what a standard platform twice the width would have, without the possibility of running 4 escalators 3-and-1 at the peak. My comment in that post has more detail, albeit with the assumption that the compound is 140 meters wide. Fbfree proposes something else: more platforms for intercity trains. Giving intercity trains more platforms (as is done in Stockholm, which has just two approach tracks to the south) gives them more time to dwell; unfortunately, it also narrows the platforms for the regional trains, precisely the ones that can expect the most crowding. Even a single-track platform would take up space out of proportion to the number of passengers it would serve. Pedestrian throughput is, at the maximum, 81 people per meter of walkway width per minute; this assumes two-way flow, but the numbers for one-way and multiway flow aren’t too different. This is a little less than 5,000 per meter-hour. An escalator bank with two up escalators then needs almost 3 meters of unobstructed platform width on one side (the other side can be used as overflow, but most passengers would use the side of the platform the train discharged them on). This is easy to supply with a 4-escalator bank on a 17-meter platform (there would be 3.8 meters); on an 8.6-meter Spanish platform, there’s only one up escalator per bank, so half the width is required, and is indeed obtainable. But if there are extra platforms for intercity trains, this becomes more strained. For maximum throughput, it is necessary to minimize separation between escalators on the platform, down to about 6 meters plus approaches, in order to allow wider walkways, which in this case would make the walkways about 25 meters wide. The point here is that the walkways have to have very high pedestrian capacity, since each of them is fed by escalators from all platforms. At 25 meters, the capacity is about 15% less than that of two up escalators per access point (121,500 vs. 144,000), which is fine since some platforms (Line 2 in both directions, Line 3 eastbound in the morning and westbound in the afternoon) would not have so much traffic. But putting in elevators would disrupt this flow somewhat. I see two ways to increase capacity in the future, if train traffic warrants it: first, build the glass floor/ceiling I outlined above, in the shelter section. This is the simplest possibility. Second, build three more walkways, midway between 7th and 8th Avenues and the two walkways already discussed, and have each walkway or avenue serve only half the platforms – one serving eastbound platforms, one serving westbound platforms. At this point the station would be half-covered by walkways, if they are all about 24 meters wide, but the walkways could be narrowed; as long as they are longer than 15 meters, any passenger arriving on a platform by any of the included access points would be sheltered by the walkway serving platforms in the opposite direction. Elevators should go from each walkway to each platform still, which would facilitate transfers, but the workhorse escalators would spread the load among different walkways. I’d originally thought that the walkways could host retail and food concessions. The calculation in the preceding section suggests that this wouldn’t be possible, unless the walkways are widened beyond the escalators, with concessions on the outside. Every meter of walkway width would be required for passenger circulation. Even information pamphlets might be restricted to the very edges of the walkways; train departure boards would have to be mounted in the air, for example on the support cables if the through-arch option were chosen for the walkways. However, there is ample room directly beneath the escalators, staircases, and walkways. With the caveat that escalators of such length need an extra midway support point, they would still have a lot of space underneath: 15-16 meters with sufficient clearance for people to stand comfortably (say, at least 2.5 meters of clearance above); with the upper approaches and the walkways, this is 60-62 meters of largely unobstructed space, for a 60*10 space that could be used in almost any way. Even in the 5-6 meters with less clearance above to the escalator, it’d be possible to use the space at least partly – for example, for sitting, or for bathrooms, the minimum clearance is reduced (I’m writing this post from my apartment, where the ceilings slope down, and the ceiling height above my couch is about 1.5 meters). There would be two such 60*10 spaces per platform, plus two smaller spaces, near 7th and 8th Avenues, depending on exact placement of access points to the subway. This gives us twelve 60*10 spaces. I doubt that they could ever host high-end concessions, such as full-service restaurants: passengers would probably not go out of their way, to a platform that they weren’t planning on using. This means newsstands could succeed, but not much else; food would have to be shunted to the streets, and presumably restaurants would pay extra to locate right outside the compound. In lieu of concessions, those spaces could host sundry uses, including additional circulation space, information pamphlets, busker performance space, waiting areas for passengers, public art displays, and waiting areas for train crew and cleaners. Let’s say the local code allows [a] vacant lot to be developed as a one story strip mall, but nothing higher. If the strip mall is worth $500,000, then the vacant lot is going to be somewhere around $75,000. In most cities, as Charles notes, there is not enough demand to redevelop every vacant lot as a high-rise, and therefore, if high-rises are permitted, a few vacant lots will be redeveloped as high-rises, while the rest remain vacant. This is not the case in large cities, which Charles specifically exempts in his article (see also Daniel Kay Hertz’s response), but part of the problem with the argument, as we will see, is that the boundary between large cities and small ones is fuzzy. Let me now explain why this argument fails, like all the other arguments for zoning restrictions: it makes implicit assumptions on future uncertainty. The reason the vacant lot owners are not willing to sell for $75,000 is that they hope to get $2.5 million. In a stable market, with low enough population that most lots cannot fetch such a high price, the lot owners know that holding off on $75,000 offers is a gamble and that they are unlikely to ever get a higher offer. People have optimism bias and might overrate the probability that they’ll get the $2.5 million offer, but also have risk aversion; in most cases in economics, risk aversion dominates, so that safer assets cost more and have lower returns. So when do we see holdouts? Risk aversion predicts that the probability of obtaining a $2.5 million offer should be higher than the total demand for new towers divided by the number of vacant lots. If we explicitly assume that the cost figures in Charles’ example, including land costs, are unchangeable, then this means vacant lot owners expect there to be more high-rise towers in the future, which comes out of growth regions. Charles’ example is based on Sarasota, which like most of Florida has high population growth. The other possibility is regulatory uncertainty. In a competitive market, land costs are already as low as they can be while letting lot owners cash out on past investments. Developer profits are also as low as possible, and represent the developer’s wage for managerial work. However, zoning restrictions will greatly raise both figures, and a lot owner who expects future developments to brush up against the present zoning code can hold out until prices rise. This is the danger of a system that is based on arbitrary rules (Charles proposes up to two floors or 1.5 times the average present height, whichever is higher), and arbitrary distinctions between small cities in which height restrictions are desirable and large cities in which they are not: these introduce political discretion in the details, which introduces additional uncertainty among lot owners. True windfalls usually involve the boundary between regulatory regimes, and this creates political incentive to game the system in order to be one of the few owners whose lots can be developed as high-rises. In contrast, once a ground rule is established that there is no zoning, such as in Houston, introducing zoning is difficult, even when there are rules that are zoning in all but name, such as parking minimums. Once we get into the realm of cities with a large proportion of their lots developed, as Charles proposes, future development can only replace old development, and this introduces a key difference between new development and redevelopment: redevelopment requires buying out the preexisting property. If a two-floor building is replaced by a three-floor building, then the developer has to not only pay construction costs for three floors, but also buy out two floors, effectively paying for five floors. But the revenue is still only that of a three-floor building, which bids up effective costs by a factor of five thirds. The formula is that if it’s possible to multiply the total built-up area by a factor of then the buy-out factor will raise the cost of each housing unit by a factor of . This effect is why, in major cities, we usually see buildings replaced by much larger buildings: for example, a three- or four-floor Manhattan building may be replaced by a fifteen- or twenty-story tower on a base. Charles laments that this is not small-scale or incremental, but even his example of good incremental development is similar: in Houston, single-family houses are replaced by low-rise apartment buildings, generating similarly high ratios of the floor areas of redevelopments with the buildings they replaced. Incrementalism in these cases consists of replacing small buildings by much larger ones, gradually, until a few decades later the entire neighborhood is tall. One way around redevelopment’s need to buy out preexisting buildings is to mandate that future buildings be built to allow adding floors on top of them. Chicago’s Blue Cross Blue Shield Tower is an example. This is a regulation that increases the average cost of construction but reduces the marginal cost and thus the price. It’s also a regulation that only really matters in situations when it is difficult to have a high ratio of new to old floor area, such as in areas that are already high-rise, especially major city CBDs. (It is easy to quintuple floor area ratio when the preexisting buildings have three floors, but not so much when they have twelve.) The current styles of construction of most small buildings, for example sloping roofs common in American and European urban and suburban houses, tend to make adding floors impossible. Of course, the implication that such a regulation should only apply for buildings above a certain height introduces political discretion and hence uncertainty, but at least this is uncertainty that would apply equally to all buildings in an area, which is not always the case for zoning. What Charles proposes, to develop all vacant lots first and only then start going taller, is then a recipe for high marginal costs, because of the buyout factor. In a small city uniformly developed up to one or two floors, it is difficult to spread the new development across many buildings up to three floors, precisely because there is no way to build single-family houses that are recognizable as such to Americans or Europeans from countries I’ve been to (It’s different in Canada, but this is considered a feature of the low quality of Vancouver’s housing) and that can have floors added to them. In such an environment, building tall is the only way to avoid high housing costs. I like Stockholm. There’s something reassuringly familiar about it, despite the language barrier, which I think comes from the fact that the Central Stockholm housing stock is of similar vintage as the residential parts of Manhattan. It even avoids New York’s most annoying (to me) architectural tic, the exposed brick. The buildings here are similar in style to the ones in New York (and more generally northern Europe), but most have smooth exterior, with enough variation of colors between buildings to make it interesting. The streets here vary a lot in width, but outside the older sections of the city, they are never very narrow. In Gamla Stan (“the old town”), the medieval core of the city that is now a tourist ghetto, complete with stores selling Swedish flags or English-language books, there are some pedestrianized streets with single-digit building-to-building width. 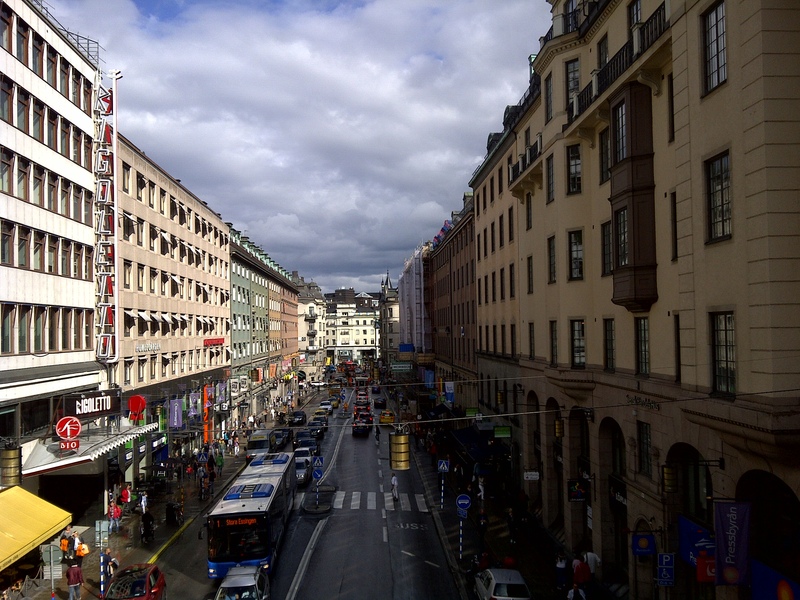 But in my part of the city – Roslagstull, near the outer end of what’s considered Central Stockholm – the street width ranges are almost identical to those of Manhattan. 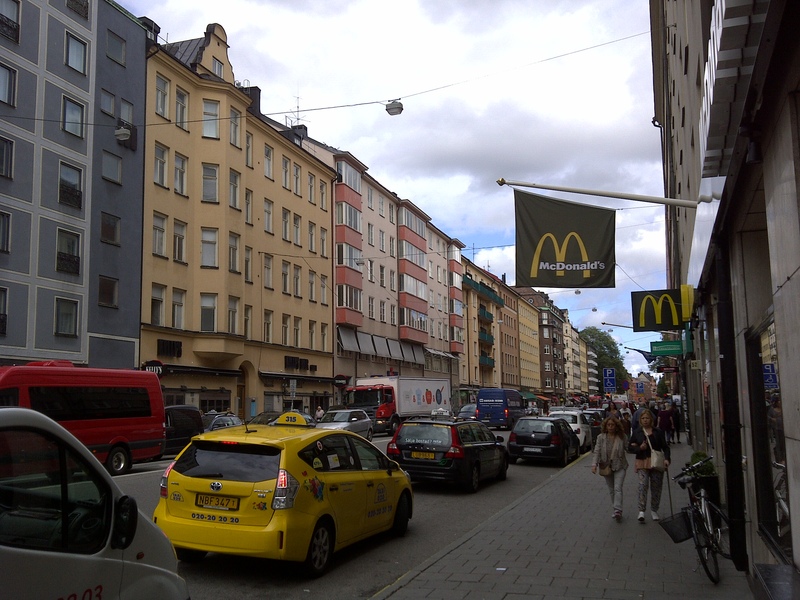 My street, Birger Jarlsgatan, is about 30 meters wide, while less important parallel streets are about 15 or 20. Like the rest of city center, it’s lined with almost uniformly mid-rise buildings, six to seven stories tall. See photos here, from Södermalm, and here, from Regeringsgatan, a street that for a portion of its length is elevated over intersecting streets. A feature of Stockholm streets that I have not seen in other cities is that on-sidewalk bike lanes. While the overall sidewalk width on Birger Jarlsgatan is generous, the sidewalk is broken by the bike lane. The inner side of the bike lane is interrupted by trees, and the outer side by sidewalk cafes, and as a result, sometimes walking in the bike lane is unavoidable if one wishes to avoid walking in zigzags. In any case, cyclist traffic does not seem to be heavy; there is much more pedestrian traffic. Crossing the street is rarely difficult. There are beg buttons at intersections, but the pedestrian light will turn green even without pressing them. The stoplight phasing is simple: most of Central Stockholm is on one of several grids, and even at intersections of two-way streets (one-way streets are uncommon, at least around Roslagstull), there are only two phases per stoplight cycle. Without grade-separated freeways in the city core, the worst streets for the pedestrians are the occasional freeway-like structure, or one of several excessively wide roads. I walk to work on one of those roads, Valhallavägen, and during the daytime, the cars’ noise and air pollution are uncomfortable unless I walk through the parking lots behind the street or the bus bay in its median. The transit system is useful, though I almost never take it. This is a combination of very high fares (with my pay-per-ride smartcard, I pay 25 kronor per ride, about PPP$2.70) and a city core that’s small enough and pedestrian-friendly enough that I can get around most of it on foot. The pedestrian orientation of the streets matters: my apartment is 2.3 km from the CBD mall and 1.7 km from Stockholm University; but I will walk to the mall, whereas to get to and from a conference at SU, I didn’t walk on Roslagsvägen (which is almost a full freeway) but instead took the subway from my university, KTH, which is more centrally located within the city. Of course, most people in the region don’t live in Central Stockholm, and for them the T-bana is a lifeline. Subway ridership here, excluding commuter rail, is about 900,000 per day (not weekday), not much lower than on the U-Bahns of much larger Berlin and Munich. As a curiosity, there are many light rail lines that connect outlying suburbs to a T-bana station, requiring a transfer to get to the CBD; the busiest, Roslagsbanan, is a narrow-gauge commuter rail system terminating next to KTH, with one T-bana branch, the T14, running parallel to it for a few stops before terminating. This is in addition to a mainline commuter rail system, with 267,000 daily passengers; this ratio of about one commuter rail rider to three subway riders is higher than anything most (see first two comments) in North America, but is much lower than in major European transit cities like Paris and London, where commuter rail and the metro have roughly equal ridership levels. Among the transit projects under construction in Stockholm is a new rail tunnel, which will increase the capacity of commuter rail. This is somewhat of an addendum to my post before about dispersal of urban networks toward cheaper cities. I addressed the question of dispersal from rich, expensive metro areas, especially San Francisco, to cheaper ones, as a way of dealing with high housing prices. But more common is dispersal within metro areas: gentrification spilling from a rebounding neighborhood to adjacent neighborhoods that remain cheaper, and office space spilling from the primary CBD to the edge cities. I am going to address the latter issue in this post. CBDs are expensive. They have intense demand for office space, as well as high-end retail and hotels. In many cities, there’s demand for office space even at the construction costs of supertall skyscrapers, going up to about $5,000-6,000 per square meter in privately-built New York towers. Zoning regimes resist the height required to accommodate everyone, and this is worse in Europe than in North America and high-income East Asia. Paris proper has many towers just above the 100 meter mark, but only three above 120. On a list of the tallest buildings in Sweden, not a single one above 100 meters is in central Stockholm, and the tallest within the zone are not in the CBD but in Södermalm; compare this with Vancouver, a metro area of similar size. But in the US, too, expanding CBDs is difficult in the face of neighborhood opposition, even in Manhattan. The solution many cities have adopted is to put the skyscrapers in edge cities. Paris famously built La Defense, which has far more skyscrapers than the city proper does; Stockholm is building skyscrapers in Kista; London built Canary Wharf; Washington, the major US city with the tightest CBD height limits, sprouted skyscraper clusters in several suburbs in Maryland and Virginia. Ryan Avent proposed this as one solution to NIMBYism: in new-build areas, there are few residents who could oppose the new development. In contrast, near zoning-constrained CBDs, not only are there many residents, but also the land is so desirable that they are typically high-income, which means they have the most political power to oppose new development. The problem with this solution is that those secondary CBDs are not public transit hubs. In Paris, this has created an east-west disparity, in which people from (typically wealthy) western suburbs can easily reach La Defense, whereas people from poorer ones need to take long RER trips and often make multiple transfers. In every transit city, the CBD is unique in that it can be reached from anywhere. To give similar accessibility to a secondary center, massive investment is required; Paris is spending tens of billions of euros on circumferential regional rail lines to improve suburb-to-suburb connectivity, expand access in the eastern suburbs, and ameliorate the east-west imbalance (see for example isochrones on PDF-pp. 20-21 of the links here). Those lines are going to be well-patronized: the estimate is 2 million daily passengers. And yet, the east-west imbalance, if nothing else, would be a lesser problem if instead of building La Defense, Paris had built up Les Halles. The situation in other cities is similar. Kista is on one branch of one subway line, two stops away from its outer terminus. Living in Central Stockholm, my coworkers and I can get to KTH on foot or by bike, but a coworker who teaches at KTH’s satellite campus in Kista has a long commute involving circumferential buses (taking the subway and changing at T-Central would be even longer because of the detour). While many individual sub-neighborhoods of Central Stockholm are quite dense, the overall density in the center is not particularly high, certainly not by the standards of Paris or New York. A similar problem happens in Washington, where the biggest edge city cluster, Tysons Corner, is traditionally auto-oriented and was only just connected to Metro, on a branch. This always affects poorer people the worst, as they can’t afford to live in the CBD, where there is easy access to all secondary destination, and often are pushed to suburbs with long commutes. There is a political economy problem here, as is usually the case with zoning. (Although in the largest cities skyscraper heights are pushing beyond the point of constant marginal costs, purchase prices at least in New York are much higher than construction costs.) The people living near CBDs, as noted before, are usually rich. The displacement of office space to the suburbs affects them the least, for three reasons. First, if they desire work within walking distance or short subway distance, they can have it, since their firms typically make enough money to afford CBD office rents. Second, since they live in the transit hub, they can access suburban jobs in any direction. And third, if the transit options are lacking, they can afford cars, although of course traffic and parking remain problematic. Against their lack of incentive to support CBD office space, they have reasons to support the status quo: the high rents keep it exclusive and push poor people away, and often the traditional mid-rise buildings are genuinely more aesthetic than skyscrapers, especially ones built in modernist style. These concerns are somewhat muted in the US, where rich people decamped for the suburbs throughout the 20th century, and have supported zoning that mandates single-family housing in the suburbs, instead of staying in the city and supporting zoning that keeps the city mid-rise. This may have a lot to do with the formation of high-rise downtowns in American cities of such size that in Europe they’d be essentially skyscraper-free. However, what’s worse in the US is the possibility of short car-free commutes to the edge cities. Where La Defense is flanked by suburbs with high residential density, and Kista’s office blocks are adjacent to medium-density housing projects for working- and middle-class people, American edge cities are usually surrounded by low-density sprawl, where they are easily accessible by car but not by any other mode of transportation. This is because the American edge cities were usually not planned to be this way, but instead arose from intersections of freeways, and developed only after the residential suburbs did. As those edge cities are usually in rich areas, the residents again successfully resist new development; this is the point made in Edgeless Cities, which notes that, in major US metro areas, growth has been less in recognizable edge cities and more in lower-density edgeless cities. As with the possibility of dispersing innovation clusters from rich, expensive metro areas to poorer and cheaper ones, the already-occurring dispersal from city centers to edge and subsequently edgeless cities has negative effects. It lengthens transit commutes. Although in Tokyo, long commutes first arose as a problem of a monocentric CBD, and the city developed secondary CBDs as a solution, the situation in European cities an order of magnitude smaller is very different. It worsens housing segregation: the development of an edge city tends to be in the direction of the favored quarter, since that’s where the senior managers live, and conversely, higher-income workers can choose to move nearby for the short commute. Although nearly all metro areas have favored quarters, decentralization of jobs thus tends to lengthen the commutes of poor people more than those of rich people. This is not quite the same as what happens when entire metro areas are forced to disperse due to housing cost. The agglomerations generally stay intact, since an entire industry can move in the same direction: smaller cities have just one major favored quarter with edge cities, and larger ones still only have a few, so that industries can specialize, for example in New York, biotech and health care cluster in the Edison-Woodbridge-New Brunswick edge city. Moreover, the specialized workers are usually high-income enough that they can stay in the central city or migrate to the favored quarter. San Francisco’s programmers are not forced to move individually to faraway poor neighborhoods; they move in larger numbers to ones near already gentrifying ones, spurring a new wave of gentrification in the process; were they to move alone, they’d lose the access to the tech shuttles. The negative effects are predominantly not on richer people, but on poorer people. The problem is that even among the poor, there is little short-term benefit from supporting upzoning. If Paris, London, and Stockholm liberalize housing and office construction, the first towers built of both kinds will be luxury, because of the large backlogs of people who would like to move in and are willing to pay far in excess of construction costs. I am going to develop this point further in two posts, on what is best called NITBYism – Not In Their Backyard – but this means that the incentive for poor and peripheral populations is not to care too much about development in rich centers. The marginal additional building in a rich city center is going to go to the upper middle class; sufficient construction would trickle to the middle class; only extensive construction would serve the working class, and then not all of it. In the US, the marginal additional building may actually displace poor people, if no new construction is allowed, simply by removing low-income apartments. It may even create local demand for high-income housing, for example by signaling that the neighborhood has improved. In San Francisco, this is compounded by the tech shuttles, as a critical mass of Silicon Valley-bound residents can justify running shuttles, creating demand for more high-income housing. The amount of construction required to benefit the bottom half of the national income distribution is likely to be massive. This is especially true in France and the UK, which have sharp income differences between the capital and the rest of the country; their backlogs of people who would like to move to the capital are likely in the millions, possibly the high millions. Such massive construction is beyond the pale of political reality: the current high-income resident population is simply not going to allow it – when forced to share a building with the working class, it pushes for poor doors, so why would it want zoning that would reduce the market-rate rent to what the working class would afford? The only political possibility in the short run is partial plans, but these are not going to be of partial use to the working class, but of no use to it, benefiting the middle class instead. As a result, there is no push by the working class and its social democratic political organs to liberalize construction, nor by the small-is-beautiful green movement. Ultimately, the attempt to bypass restrictions on urban CBD formation by building edge cities, like every other kludge, is doomed to failure. The fundamental problem of rich people making it illegal to build housing nearby is not solved, and is often made even worse. The commutes get worse, and the inequality in commutes between the rich and the poor grows. Office space gets built, where otherwise it would spread along a larger share of the medium-rise CBD, but for most workers, this is not an improvement, and the environmental effects of more driving have negative consequences globally. And once city center is abandoned to the rich, there is no significant political force that can rectify the situation. What seems like a workaround and an acceptable compromise only makes the situation worse. A major idea due to Jarrett Walker, adopted with gusto by Vancouver’s Translink, is that transit should be anchored at both ends. That is, transit lines should have busy destinations at both ends, and should strive to reorient development such that the maximum intensity is near the ends. I was skeptical about this from the start, but now that I live in Vancouver and see the practice every time I go to UBC, I realize it’s much worse. Both in theory and in practice, this argument fails to note that a bus with development at the ends will be overcrowded the entire way, because people will travel longer. If UBC were located around Central Broadway instead of at the very west end of the metro area, people would just have shorter travel time; at no point would there be more westbound a.m. crowding because at no point would there be more westbound passengers traveling at the peak. There would be more eastbound a.m. crowding, but that’s not the Broadway buses’ limiting factor. Of the top four routes for passups, which have far more than the fifth route, three are east-west with strong anchors at both end (UBC at the west, the Expo Line at the east) and one, the third worst, is a C-shaped amalgamation of two north-south routes, with peak development downtown, in the middle of the C.
On a theoretical level, development intensity is a result of high land prices justifying high density, and in an urban area high land prices come from proximity to other urban land. In cities without topographic or political constraints on development, the CBD is always near the center of the metro area, and in coastal cities the CBD is usually near the shore but near the center along the axis parallel to the shore. Major secondary nodes usually arise in areas close to many suburbs, often the richer ones, and there’s travel demand to them from all directions: see for examples La Defense near Paris and Shinjuku and the other secondary CBDs in Tokyo. Some of those nodes happen to be near the shore (UBC, Santa Monica and Long Beach, Coney Island) but most aren’t. Any newly-built anchor will sprout further development around it unless there’s very strong local resistance. To connect all those neighborhoods that lie beyond the secondary CBD, unanchored transit lines are then unavoidable. We’re left then with anchors that are at geographic edges, such as on shores. Those raise travel distances, because people can only live at one direction from them, so for a given residential density they will have to travel longer on average. They look attractive to transit managers because they also make the buses more uniformly full, but they’re worse for passengers who have to travel longer, often standing the entire way because of overcrowding. They’re not even good for transit agency finance, because urban transit invariably has either flat fare (as is the case within Vancouver proper) or fare that depends on distance fairly weakly. Short trips generate as much or almost as much money for the agency while requiring less effort to run because of lower crowding levels. Trips in which most passengers ride end to end are the least efficient, unless they can overcome this with very high crowding levels all day. Now, what does help finances as well as the passenger experience is bidirectional demand. Anchors are good at that. However, what’s just as useful in cases of asymmetric peak demand is destinations that are short of the most crowded points. For example, in Manhattan the north-south subways fill as they go southward in the a.m. peak. This means that commercial buildings north of Midtown, generating passenger traffic that either is northbound (hence, reverse-peak) or gets off the train before it gets the most crowded within Midtown, add ridership without requiring running more trains. The MTA’s guidelines explicitly call for matching frequency to demand at the most crowded point of each line based on uniform sets of peak and off-peak crowding guidelines. This favors not outlying anchors, but development sprinkled uniformly along transit lines outside the CBD. The same development in the North Bronx would have low transit mode share (UBC has high transit mode share, but it’s at a geographic edge, and on top of that it has a huge body of students), while on the Upper East Side and Upper West Side it would have high transit mode share. The only outer ends where heavy upzoning is appropriate are those that aren’t really ends, such as Flushing and Jamaica, preexisting secondary centers in their own right to which people take the subway from the west and drive from the east. De facto, Translink makes cost figures available for each bus route, and we can compare costs per boarded passenger on the east-west routes and on the north-south ones. The east-west routes have an initial advantage because they have bidirectional peak demand, whereas the north-south and C-shaped ones do not, and have few destinations short of the CBD, mainly just on Central Broadway or Commercial Drive. Despite this inherent east-west advantage, cost per rider is not lower on the east-west lines. Of the top ten route numbers, there are five balanced east-west routes: 99, 9, 41, 49, 25; and four north-south or C-shaped ones serving downtown: 20, 16, 8, 3. (The 135 is east-west connecting downtown with SFU, and could be included in either category.) Going in the same order as above, the east-west routes cost $0.61, $1.21, $1.10, $1.31, $1.47 per passenger, while the north-south ones cost $1.02, $1.29, $1.09, $1.06. (The 135 costs $1.32.) The three routes that interline to UBC on 4th Avenue – the 4, 84, and 44 – cost $1.62, $1.30, and $0.78 respectively, averaging to $1.30; the 84 is anchored at the Millennium Line, the 44 is anchored downtown, and the 4 is anchored downtown but also continues farther east. The 99 is much cheaper to run than the other routes despite its high proportion of end-to-end ridership, but it is also critically crowded and benefits from multiple peaks as it serves both a secondary CBD and a university; it is also express, which among the other routes under discussion is only true of the 44, the 84, and the 135. Among the local routes, the north-south routes are actually a bit cheaper to run than the east-west routes even if we exclude the 4 as a not fully anchored exception. The 20, the 8, and the 3 all have their maximum development intensity at the downtown end with some extra development in their inner areas, near SkyTrain and Broadway, and a lot of medium-intensity development at the tail. This provides suitable short-of-CBD destinations adding passengers at low cost. For one measure of productivity, we can divide the number of boardings per hour by the average load. The result is the reciprocal of the average number of hours spent by each passenger on the bus; a higher number means each passenger spends less time on the bus, indicating higher turnover, or equivalently more revenue relative to crowding. The 99, 9, 41, 49, and 25 have ratios of 2.79, 3.13, 2.65, 1.93, 2.13; the 20, 16, 8, and 3 have ratios of 3.26, 2.73, 3.57, 3.24. The 20, 8, and 3 again look very good here, helping explain their low operating costs and also their low crowding (they rank 12th, 27th, and 20th respectively in passups but 2nd, 6th, and 7th in weekday ridership). The 49 and 25, both highly anchored routes, do not look as good, and indeed have many passups relative to ridership (they rank 1st and 4th in passups but 8th and 10th in weekday ridership); they have the redeeming feature that they protrude slightly into Burnaby, where zonal fares are higher, but judging by a map of the passups, the 25 seems to get a large majority of its ridership strictly within Vancouver, with Nanaimo Station as the eastern anchor rather than Brentwood. We can extend this analysis further by looking at New York’s bus operating costs. Cap’n Transit laboriously compiled a spreadsheet of operating cost per New York City Transit bus route. Within Manhattan, the pattern is that east-west routes have much lower operating costs per passenger than north-south routes. The M15, the busiest route in Manhattan with ridership comparable to that of the 99 in Vancouver and with the best finances among the north-south routes, almost breaks even on direct operating costs; most of the major east-east routes are outright profitable counting only direct operating costs. The key difference is that the east-west routes are much shorter, so passengers are paying the same amount of money for less distance. In his own analysis, the Cap’n notes that the express bus with the best finances is also one of the shortest, and that in general the profitable-after-direct-operating-costs buses have many transfer points to the subway, which suggests short trips as well. Having seen more evidence for the theory that good bus finances require short trips rather than endpoint anchors, we can go back to Vancouver and compare more routes. The busiest north-south route not on the above list, the 2/22, works more like the 16 than like the 20, 8, and 3: not only is the 22 C-shaped rather than terminating downtown, but also it serves corridors that are less busy than Commercial and inner Main, reducing the availability of short trips. The shorter 2, overlying the longer 22, has 3.42 boardings per hour per load, but still costs $1.43 per rider; the 22 has only 2.15 boardings per hour per load and costs $1.61 per rider, and also ranks 3rd citywide in passups versus 11th in weekday ridership. On both the 16 and the 22, the north-south legs (Arbutus and Renfrew for the 16, Macdonald and Clark/Knight for the 22) are streets that aren’t very busy by themselves, but instead act as important cross-streets for Broadway and other east-west streets. Here are Knight, Renfrew, Arbutus, and Macdonald, and here are, by contrast, Commercial, Fraser, and Main, all around the same cross avenue (near but not at 16th). The same is true of the east-west buses. The 99, 9, and 41 have better finances than the 49 and the 25. They also do better on passups, ranking 2nd, 11th, and 10th versus 1st, 3rd, and 4th in ridership. The 99 has much better finances than all other buses, which can be chalked to its overcrowding, but ultimately comes from continuous intense development all over Broadway making it a prime corridor. 41st has some of this development as well: here is how a strip of it looks close to the cross street I live on. Compare this with 49th and King Edward around the same cross street. This is not cherry-picked: 49th and King Edward just aren’t commercial streets, and even where they act as important cross streets such as at Cambie there’s not much development there. Of course 4th does have this commercial development and is almost as expensive as 49th and King Edward, but its commercial development is discontinuous, and the relatively intense section between Granville and Balsam is short enough that people can walk it. So what this means for transit-friendly development is that it should not worry about anchoring, but instead try to encourage short trips on local transit. In his original post about Vancouver’s anchoring, Jarrett says of Marine Drive, at the southern edge of Vancouver proper, “From a transit efficiency standpoint, it would be a good place for some towers.” This is not good transit: from the perspective of both costs and ridership any residential development south of Broadway in which people take the bus downtown is equivalent, so might as well put it immediately south of Broadway or at King Edward, 41st, or 49th to connect with the east-west bus routes and let people live closer to work. Commercial development, too, is best placed short of downtown, because if it’s on Marine Drive people will drive to it whereas if it’s along the blocks immediately south of Broadway many won’t. Better would be to do what Vancouver hasn’t done, and encourage medium-intensity development all over the major corridors, of the kind that exists on Commercial, Fraser, Main, and 41st and allows their respective bus routes to serve productive short trips, generating low costs without excessive crowding. Towers on Marine Drive, to the extent that their inhabitants would even use transit instead of driving, would clog all the north-south buses. Mixed-use medium-rise development running continuously along Arbutus (which already has an abandoned rail corridor that could make a relief light rail line if the Canada Line gets too crowded) and the major east-west corridors would have the opposite effect, encouraging local trips that wouldn’t even show up at the most crowded point of the line. I’ve argued before that this urban layout is good for walkability, but it appears to also be good for surface transit productivity. This is also relevant to upzoning around SkyTrain stations. There has not been so far any upzoning around Cambie, even though the Canada Line has been in operation for 3.5 years and was approved for construction over 8 years ago, but there will be some very soon. Vancouver’s draft plan, as shown on PDF-pages 26-27, permits 4 floors of residential development on the cross streets with the stations, 6 on Cambie itself, and between 6 and 12 with mixed use near the stations themselves. Continuous commercial development will be permitted only on Cambie between 41st and 49th. This will be of some use to the east-west buses because there will be more destinations at Cambie, but it will not create the same variety of small destinations available on Main, Fraser, 41st, Commercial, and Broadway, not without further upzoning near intersections that are nowhere near SkyTrain. It’s better than the towers of the Burnaby stations, but it’s still not very good. There is commercial upzoning near Marine Drive, but that can’t be very transit-oriented given the location, and it can’t do much for north-south bus productivity since in the nearby neighborhoods car ownership is high. It’s too late to change the rezoning plan to permit more linear commercial development on the cross streets, but it’s possible to do better when Vancouver gets around to building Broadway SkyTrain. On Broadway itself, general intensification, allowing more residential density and replacing residential-only zoning with mixed-use zoning, should suffice. There is continuous commercial development from east of Cambie to west of Arbutus, with a two-block gap to Macdonald, and a one-block gap between Macdonald and Alma; both gaps are within a few hundred meters of the cross streets and can be closed easily. The Alma-Sasamat gap on 10th is probably too hard, though. The Arbutus-Macdonald gap on 4th can also be closed, though those blocks are nearly a kilometer from where the stations would be. But it’s as important to allow commercial zoning extending as far south as possible on the major north-south streets, especially Arbutus. Continuous mixed-use zoning should extend at least as far as 16th, and maximum residential density should be at a minimum 4 floors and ideally 6, as Arbutus, Macdonald, and 16th are very wide and the intersections feel out of scale to the current 1-story development. Of course, this principle of design is true only of urban transit, both surface and rapid. Once the stop spacing increases to regional rail levels, it is no longer feasible to have continuous commercial development, and usually the street networks of the different suburbs are separate anyway without continuous arterials. In all cases it’s important to allow commercial zoning around stations, but the spiky development characteristic of the Expo and Millennium Lines becomes a better idea the longer the stop spacing is. Endpoint anchoring also becomes more justifiable at near-intercity scales, such as New York-New Haven or Boston-Providence: the fares are closer to proportional to distance, and also neither New Haven nor Providence is sprouting suburbs at such scale and distance that it’s justifiable to extend Metro-North or the MBTA with their usual stop spacing past those cities. But at the scale of urban transit, or even inner regional rail, the natural endpoint of a line is not a secondary anchor, and transit agencies should control peak-to-base ratios by commercial upzoning along corridors and near many stations outside the CBD rather than by making people ride transit kilometers longer than would be necessary if the zoning were different.